“Tory Day of Treachery” was the headline blazoned across Friday's front page of the Daily Mail, an influential middle-market British tabloid that campaigned vigorously to break with the European Union. 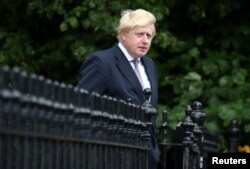 Marking Thursday’s surprise announcement by Boris Johnson, in which the mop-headed former London mayor said he would not contest leadership of the ruling Conservative Party, the paper said the political fight to replace outgoing Prime Minister David Cameron is seeing “the most savage bloodletting" since the fall of Margaret Thatcher. In the wake of Britain’s Brexit referendum, Conservative politicians are hatching plots in the genteel surroundings of the tearooms of the House of Commons. Allies are falling out as politicians scramble to shore up their personal ambitions amid ever more sordid political skullduggery worthy of a Shakespearean drama. Johnson, one of the chief "Vote Leave" campaigners in last week’s referendum on EU membership, was forced to relinquish his ambition to become prime minister after being ambushed by friend and anti-EU ally Michael Gove, a parliamentarian who abruptly announced his own candidacy for the job, despite the fact that he was meant to be the campaign manager for Johnson’s party leadership bid. ''Et tu Brute,” Johnson's father Stanley said in reaction to Gove’s decision, quoting Julius Caesar’s rebuke as his friend Brutus stabs him in Shakespeare’s play. By announcing his candidacy, Gove split anti-EU Conservative lawmakers who have to offer up to the wider party of 150,000 grassroots members two candidates out of the half-dozen seeking the leadership. In entering the race, Gove made it impossible for Johnson to beat the favorite Theresa May when it comes to the ballot the Tory lawmakers will hold. Gove also stole a march on Johnson by announcing first, a betrayal that appeared to deal a deep shock to the former mayor. On the other side of the political aisle, Labour’s discord is even more opaque with party leader Jeremy Corbyn rebuffing efforts to persuade him to quit. A Jewish Labour lawmaker Thursday stormed out of a House of Commons event, offended at anti-Semitic slurs aimed at an anti-Corbyn colleague. 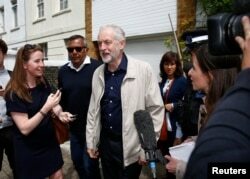 FILE - Britain's opposition Labour Party leader Jeremy Corbyn (C) leaves his home in London, June 26, 2016. On the BBC’s flagship show Question Time Thursday, featuring politicians who take questions from a studio audience, disdain for the country’s political class was manifest. “I am starting to think I have been played,” said a young woman, who had voted to leave the EU. “Is there no shame or loyalty in politics?” asked an elderly woman. “If you think it is a mess, you would be right to believe that,” conceded Education Minister Sam Gyimah. The post-Brexit political infighting has pushed from newspaper front pages the broader and even more dangerous economic challenges facing Britain. And it is adding to a palpable sense of public alarm about how negotiations with the EU are going to be handled and what Britain will look like in the near future. His comments have been interpreted here as an offer to assist with Brexit negotiations. And he isn’t the only former prime minister or retired senior politician keen to help steer Britain through this period. While the current crop of active politicians engages in divisive internal party skirmishes, there is more unity among former politicians and across party lines. VOA understands that former prime ministers Blair, Gordon Brown and John Major, as well as other retired top politicians, have discussed how they can act in concert behind the scenes to offer counsel to the new prime minister, widely expected to be Theresa May, and, to act as go-betweens by using their own longstanding contacts with European politicians to salvage something from the upheaval of the Brexit referendum — clinching at least a close partnership for Britain with the bloc and a free trade deal. “I think you will see the older generation getting a lot more involved,” Margaret Hodge, a former Labour minister, told VOA. Many of the former politicians keen to play an active if discreet role have executive jobs now in big business and the City of London, where fears are mounting at the Brexit fallout. Attendees described as “funereal” a Downing Street meeting Thursday among 19 business leaders and Prime Minister Cameron, who urged them not to fixate on the EU and to find new markets beyond Europe. His plea fell on the deaf ears of at least one chief executive, Carolyn McCall. On Friday it emerged her company, Britain’s highly successful low-cost airline EasyJet, is considering relocating its legal headquarters to the continent. With all the farcical twists and tragic turns in party politics, few newspapers bothered reporting on the comments on Britain’s “Economic post-traumatic stress” by the governor of the Bank of England. In a stark warning to politicians, Carney said a downturn was on its way and signaled interest rate cuts and looser money.